The images at the top and bottom of this post were made in Processing and were inspired by some of the exercises from the 1972 book Principles of Two-Dimensional Design by Wucius Wong. 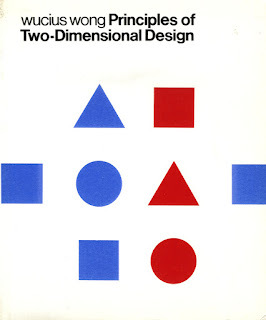 Forty years ago this book introduced a language for thinking and talking about the then emerging world of modern design. Today it could also be a source of exercises in basic programming, particularly well-suited for Processing. Wong's later book, Principles of Three-Dimensional Design includes really nice examples of geometric sculpture, many based on polyhedral forms. I thought I would try to make some printable colouring pages of phyllotaxis spirals - thinking that they could be coloured-in using multiplication-table / skip-counting rules to make patterns like the ones shown in the previous post. I've put a two-page pdf here - page one has a spiral with the numbers filled in (as above), and page two has one without numbers (for unfettered colouring). When colouring these in, you might just shade the multiples of five - and get the picture below. You also can't avoid noticing a radial pattern as the dots seem to line out on spokes pointing out from the center. Take a closer look at that, and you'll see that adjacent numbers on the radial arms always have a difference of 55. Neato! this was something I didn't see when I generated the same pattern via software - using a pencil slows things down a bit and helps you notice things. I'm wondering what relationships might be found in the patterns that other multiplicative colouring rules produce. Postscript: I shouldn't have been surprised! Any time you make a number spiral skip-counting by n with k spokes, the difference along the spokes is going to be nk - in this case, skip counting by 5 and generating 11 spokes gives a radial difference of 55.